These Chainmail Gloves are a comfortable medium between plated steel protection and mobility, ensuring that your hands are well-protected, while still preserving the dexterity and deft finger movement necessary for good swordplay. These are chainmail enhance,comfortable suede leather gloves, for defensive abilities. The attached mail is composed of 16 gauge, 8mm mild steel butted rings, in a classic and traditional 1-in-4 pattern. The mail also features a galvanized finish, which lends it a bit of a polished look that will shine and gleam in the light. These mail gloves are offered in one size, and they come as a matched pair. 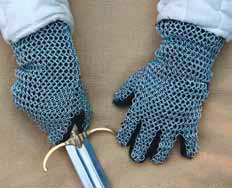 The mail covers only the exterior of the gauntlet, leaving the palm free to grip swords, shields, and other weapons without metallic interference. Good, solid protection for your hands is not so hard to achieve, with these Chainmail Gloves at hand. Siege of Niš on 4 July 1096. This page was last modified on 4 May 2014, at 16:19.